The experienced technical experts at Expert Logistics can help your goods clear quickly and efficiently with an automated customs clearance network. 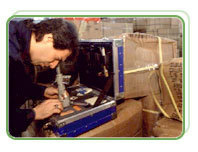 Our customs experts can guide you through the complexity of customs department. Besides vessel agency & freight forwarding work, United Safeway India Pvt Ltd. is also providing service of custom clearing of all the documents related either to Import or Export on behalf of our esteem clients specially who are importing / loading their at Kandla / Mundra / Pipavav / Cochin / Tuticorin / Mangalore and many more..
Clients can avail from us a reliable range of Project Forwarding Services. Within these services, we are able to offer global logistics support along with customized status reporting. We carry out preplanned and supervised loading and discharge of cargoes, which are aided by advanced material handling equipment. We are looking for Chennai queries. Robinsons Cargo And Logistics Pvt. Ltd.
We are a renowned organization, which is engaged in rendering Sea Freight Clearing Service to esteemed patrons. These services are rendered by efficient experts, who make sure to use modern machines and latest technology to follow international standards. Along with this, our services incorporates lifting facility of goods and dispatching directly to the customer's door. We Offer unparalleled Custom Broking Services. Since our inception, we have been growing day by day as a trustworthy and popular Custom Broking Agents, offering world class Custom Clearing Services from India. It is our endeavor to enhance our customer's delight by offering them right solution at right time. We are Customs Clearing Agents and gets your shipments examined at the customs.Specialized in the clearance at ports.Ensuring hassle free shipment, we get the documents finalized. HSN classification, rate of duty, preparation of bills of entry, processing the customs clearance, assessment, customs examination and obtaining customs out of charge and arranging dispatch, delivery to the destination. Among the broad array of services, there also exists service of Custom Clearance. We provide efficient custom clearance services to add value to customers. We are considered to be among the prominent service providers of Custom Clearance services. We offer advice to them on appropriate goods clearing procedures. We have a team of skilled professionals that have a domain expertise in the field. Includes consultancy with relation to Shipping/Air Freighting matters like Custom Laws, Export/Import Policies, Port Rules, Insurance etc..